Commissioned for the Art on Campus Collection by the Office of the President, Sesquicentennial Planning Committee, University Museums, Iowa State University, Ames, Iowa and by Sticks, Des Moines, Iowa. It is in the Art on Campus Collection, University Museums. The university commissioned artist and owner of Sticks, Sarah Grant, to create a commemorative art mural for Iowa State's 150th birthday. 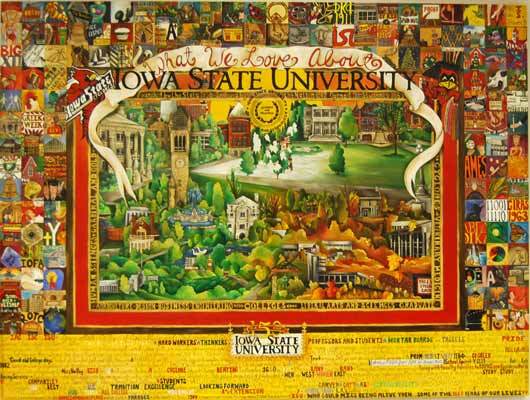 Titled What We Love About Iowa State, this work captures the history, traditions, and excellence of the university that make it so special for students, alumni, faculty, staff and friends. The mural's concept was a collaboration between the university and Ms. Grant, whose hometown is Ames, Iowa, home of Iowa State. Alumni, students, faculty and staff were asked to submit what they love about Iowa State and their suggestions were incorporated into the design. Also, the artist researched the history of Iowa State to find her inspiration for portions of the art.